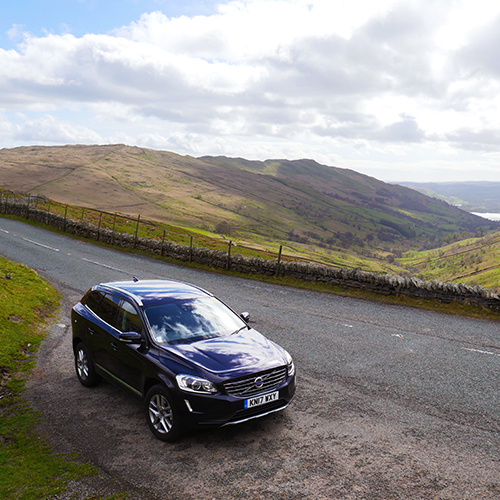 On day 3 of my road trip around Cumbria, it was time to think about returning my hire car to Hertz, but not before I’d done a little more exploring while I still had the Volvo to drive. My plan was to take the car on another of the Lake District’s famous roads – the Kirkstone Pass. 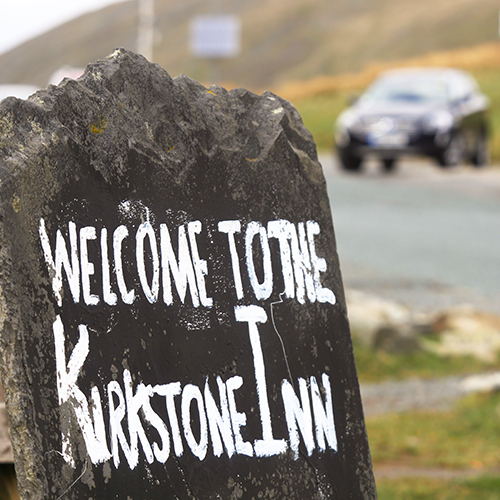 The Kirkstone Pass is the highest of the Lake District’s passes that is open to motor vehicles, reaching a height of 1,489 feet and, in places, having a gradient of 1 in 4. It is named after a nearby rock that resembles a church steeple (or ‘kirk’). In times gone by, this road was not paved and horses struggled to pull their carriages over the peak, so passengers would disembark and walk alongside in order to lighten their load and help them along. Thankfully my Volvo had all-wheel drive features so I didn’t have this problem! 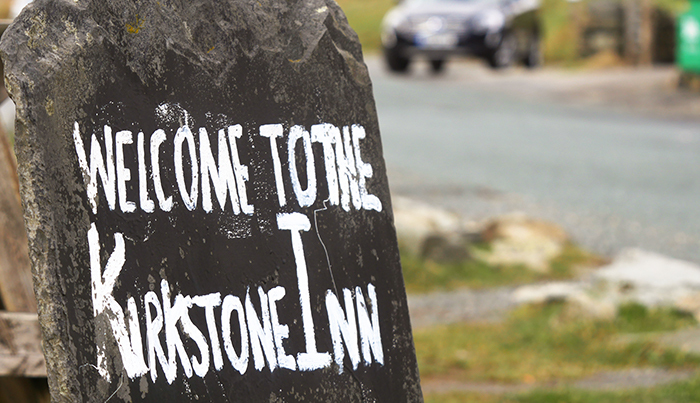 Close to the summit is a former coaching inn, The Kirkstone Pass Inn, which is one of the highest pubs in the country and today enjoys the passing tourist trade. On a clear day, the views from the entrance to the pub are stunning and there are picnic tables outside should the weather be favourable. Inside, it’s a rather cosy affair with an open fire. 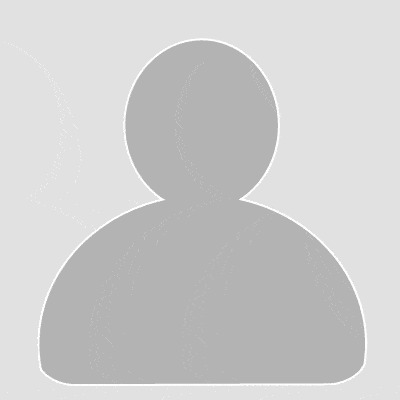 The area open to the public is quite small but provides an intimate atmosphere. 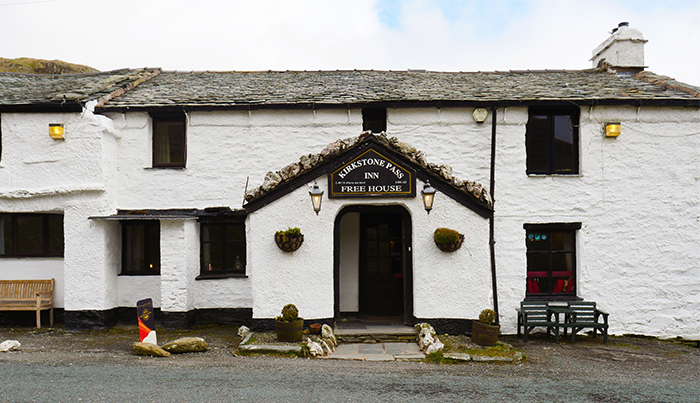 Typical pub fayre is available, including Cumberland sausage and mash and steak and ale pie. 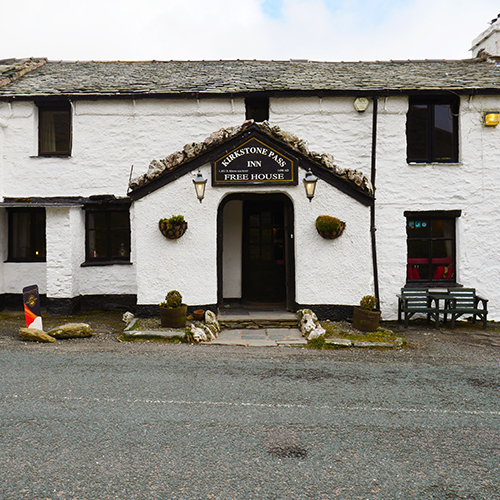 For those not driving, local beers on draught include Eden Best, Kirkstone Black and Kirkstone Gold, all emanating from three different breweries in the county. After the Kirkstone Pass Inn, the road descends towards Brotherswater where the daffodils were in bloom. Poet William Wordsworth, who lived in Grasmere, famously wrote about the golden daffodils “fluttering and dancing in the breeze”. 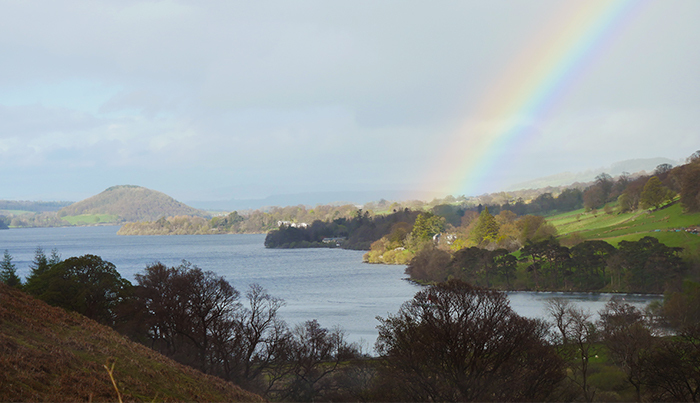 I continued to follow this course but took the opportunity to take the car on a detour to Martindale which also offers some great driving and an equally wonderful view of Ullswater. From there, I headed in the direction of Greystoke (of Tarzan fame) to visit a dairy farm I’d heard about. 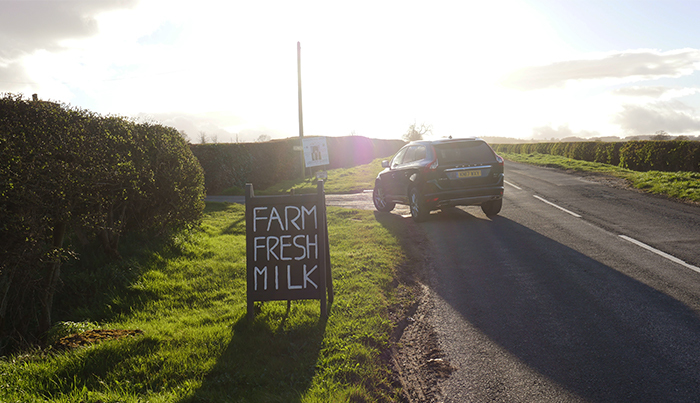 There’s no mistaking the turn-off for the dairy farm – just like you might get markers on a motorway to signify an impending sliproad (signalled by three lines, two lines and then just one line), as you get nearer you’ll see signs showing three milk bottles, then two and then just one! Dairy farmer Mike Walsh has capitalised on the high quality of his milk by selling some of it unpasteurised directly to the public. To ensure safety, the milk is tested on a weekly basis by his main buyer in addition to tests carried out by environmental health officers. 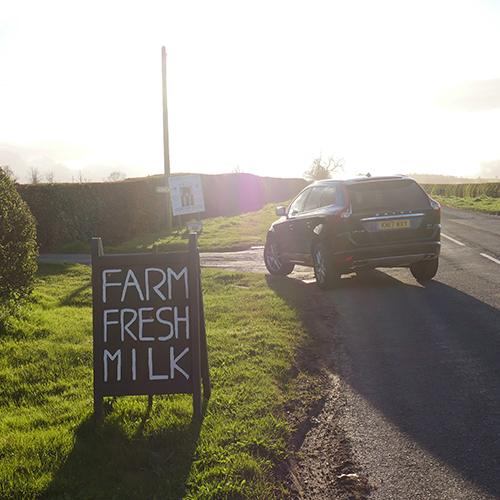 Not only that, Bunkers Hill Dairy has a novel approach to selling milk – you can buy it directly from a self-service vending machine. A DF Italia milk vending machine, capable of holding up to 150 litres, has been installed in a converted parlour and guests can help themselves to one- or two-litre containers which they can fill at £1 or £2 respectively. It’s a hit not just with locals, but has also attracted custom from visitors from Australia, New Zealand and Japan. 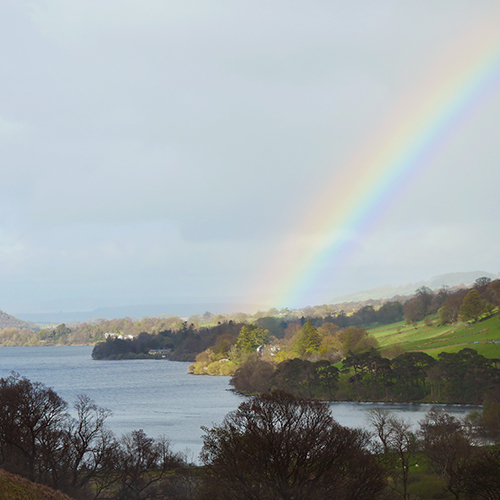 With my containers filled, it was time to return the car to Hertz in Lancaster – almost an hour on the motorway but probably some of most beautiful motorway driving to be found in the UK – in order to complete my culinary adventure. This stretch of motorway passes the Westmorland Tebay service station. If you do wish to stretch your legs, this is the place to do so. It’s one of the few remaining independent service stations and a regular award-winner. Tatler called in Britain’s ‘swankiest service station’ whilst both the North- and South-bound stations are two of only seven in the country to be awarded a five-star rating by VisitEngland’s Motorway Service Area Quality Scheme. On site there is a farm shop and a restaurant serving anything from venison to scones. By the time I reached Lancaster, my journey was complete. The Hertz depot has recently moved to the Holiday Inn, close to the newly re-vamped motorway junction, and only a couple of miles from the railway station.